I suppose if you asked me what I "expect" the kids to do with these blocks, I would say, "Build," but from the moment I saw them in the catalog, I knew there was another side to them: a wild side, a dangerous side, the side that would have appealed to me as a boy. I usually tell the parent-teacher responsible for the block area that I consider playing with these blocks to be the single most dangerous thing we do at Woodland Park. Heads collide. Smaller children have blocks, along with bodies, fall on them. Structures that look both soft and stable, topple over when we try to climb on them . . . Their greatest danger, however, lies in their apparently safety. They're soft and light, right? There are no sharp corners, no hard parts. Inexperienced children and adults alike tend to "let down" when they see them, as if these pillow-like qualities reduce their own responsibility be cautious, to assess risk, and consider others. I once made the mistake of laying gym mats down under them: never had we had more tears than on that day as caution was thrown to the wind. I'm not big on planning too far in advance when it comes to our preschool classroom, but I do when it comes to these blocks. By now I anticipate that there will be a few kids who will feel the irresistible urge to hurl their bodies into every rampart, regardless of how many of their friends are playing on the other side. I know in advance that these toys will trigger some kids to rough house, throw and leap wildly into a pile. And it only takes one or two kids with these instincts to take over the area, driving the rest of the kids away. This year we tried preparing for the annual advent of these blocks a week ahead of time with activities like wrestling and mat slamming, a couple of activities that satisfy these urges, while also putting a focus on doing so safely and with consideration for the rest of the kids who have legitimate interest in playing with these blocks in ways that don't involve body hurling. Honestly, I can't say whether or not it worked to let off a little bit of the steam and provide practice in keeping "rules" in mind while physically fully engaged, but this past week or so has been relatively mild, both in in the 3-5's and 5's classes. There have been the occasional reminders along the lines of, "Hey! You knocked down my building!" and "Stop! You're squished me!" but nothing like in years past. The reason I can't say whether or not our "planning" worked is that each year brings a different mix of kids, with different temperaments, both as individuals and collectively. Give us a few more years of trying it this way: then we'll begin to know something. Nevertheless, dramatic play has been the primary focus, rather than the usual build-it-up-and-knock-it-down type play that usually characterizes these blocks, with any number of castles and forts being built. It's been gratifying to me to stand back and observe rather than to be on my knees in the midst of things, coaching kids through conflict resolution. Our 5's class, in particular, have settled on a game they like to play together that involves using all the blocks to build a castle in which each of them has her or his own "room." They've been choosing roles -- princess, guard, pet cat, pet dragon, big sister -- then retiring to their rooms and talking. Seriously. 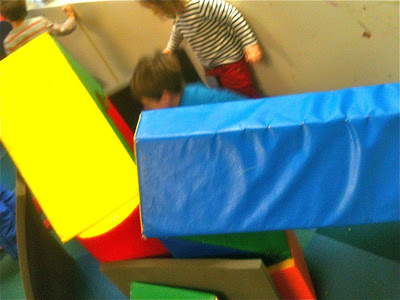 That's how these kids have been playing with our dangerous blocks: hanging out in costumes talking. Gus has been adopting the role of king, which gives him the "power" to tell everyone else what to do. He's been a benevolent dictator, usually issuing the order, "Do whatever you want," but at some point he began to command his subjects on the matter of when to sleep and when to awake. I've supported this game by turning the lights in this corner of the room off at night, then on when the king commands it to be morning. It's been a very popular game, often involving more than a dozen kids. Last Friday, after having played more or less the same game all week, Gus and a handful of boys began to once more set things up, cobbling together their own "rooms," neglecting the rest of the castle. A couple of them, then began calling out to the rest of their classmates to let them know the game was beginning, "Come to the castle! Come to the castle!" but to no avail. After surveying the room for a moment, King Gus said, "We need to get some princesses over here. We're going to have to make it a lot nicer." Now by this time, most of the "good blocks" (e.g., bigger blocks) were already in use. "We need to build the rest of the castle." At first, some of the guys were unwilling to give up their blocks. Gus said, "Hey, if we don't build the castle, the princesses won't come." With his earnest urging, the boys got to work, more or less recreating the castle from the day before. And an interesting thing happened. As they built, the girls, as planned, actually began to take notice. When a couple of them began to put on costume dresses, Gus whispered, "The princesses are coming!" As they arrived at the castle, one-by-one, they were offered blocks with which to build their rooms. It was really a sight to behold. 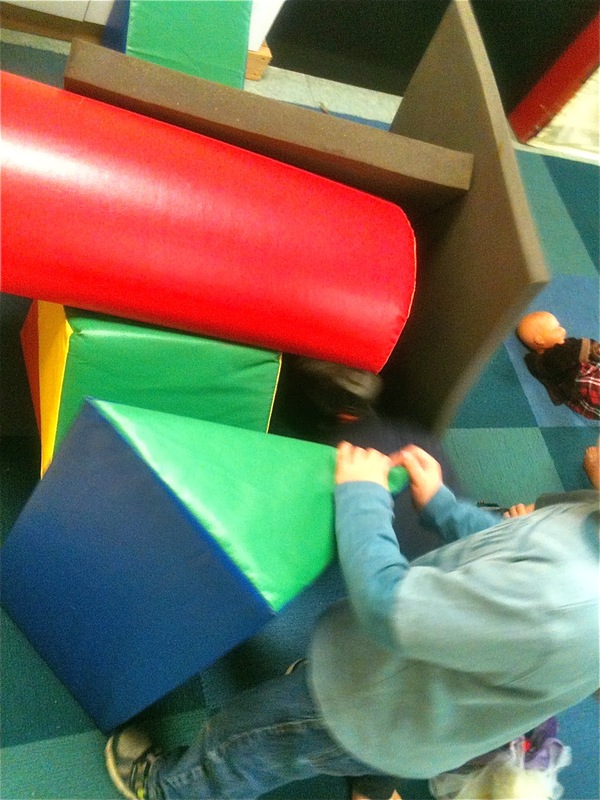 Later as I stood at the doorway, watching a dozen preschoolers play with our "dangerous blocks" by pretending to nap in a darkened room, I began to think of ways to use them for a wilder kind of play.